Hainanese chicken rice is one of my all time favourite meals. For those of you who haven’t had it, it’s a simple chicken and rice dish that is deceptively full of flavour. I say it’s deceptive because it’s literally just a plate of chicken and rice. But really, it’s so much more than just a plate of chicken and rice. I love chicken rice so much that when I make it I tend to eat entirely too much and end up in food coma. It’s the rice that really does it for me. I can eat bowls and bowls of it: it’s gingery, garlicky and so, so chicken-y. You fry uncooked rice in chicken fat to give it an intense chicken flavour. But now I’m being deceptive — this isn’t actually a post about chicken rice. Instead it’s a lightened up Chinese-Vietnamese mash-up. In efforts to not consume 6 cups of rice myself, I decided to take everything I love about chicken rice (aside from the rice) and wrap it into a summer roll. Summer rolls, or salad rolls are easy to make and even easier to eat. I love preparing everything in advance then inviting a bunch of people over so everyone can customize their own rolls at the table. 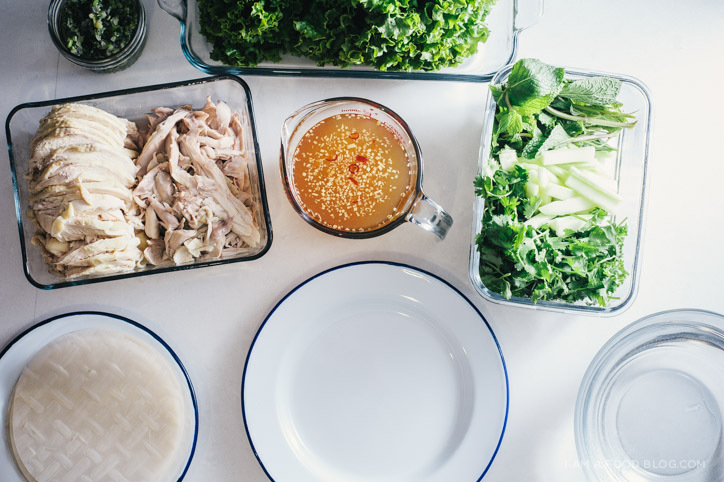 The idea is simple: steamed chicken, lettuce, whatever Vietnamese herbs you can get your hands on, vermicelli, green onion oil and a gingered-up fish sauce. Fill, roll, dip, repeat. I tried really hard not to fall into a food coma, but I could not stop myself from eating roll after roll — they were just that good! These rolls seem like a lot of work, but they aren’t — you just need to have a game plan. 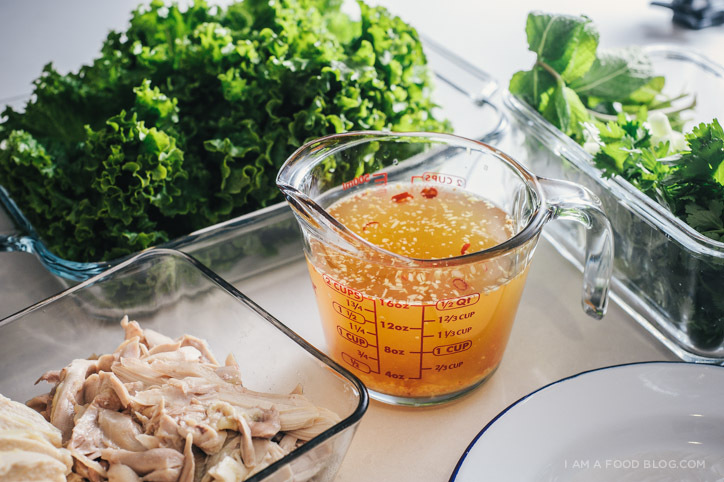 While the chicken’s cooking, go ahead and make the green onion oil, gingery fish sauce and wash and prepare all your vegetables. By the time the chicken’s done, you’ll be ready to roll. 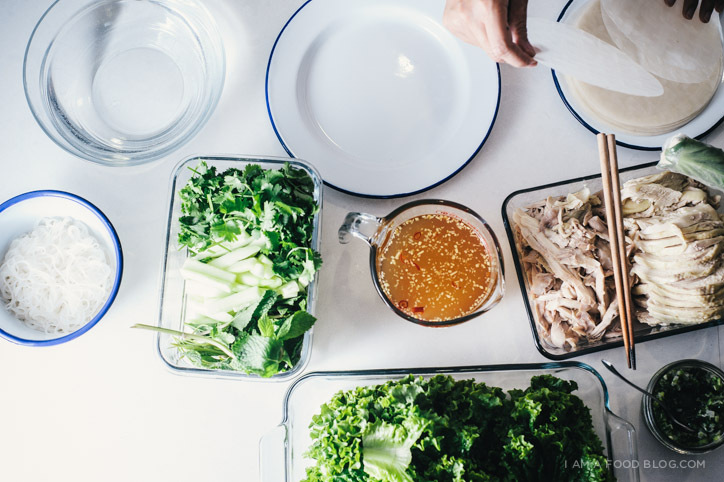 i am chicken-y, i am rolled: i am hainanese chicken summer roll! 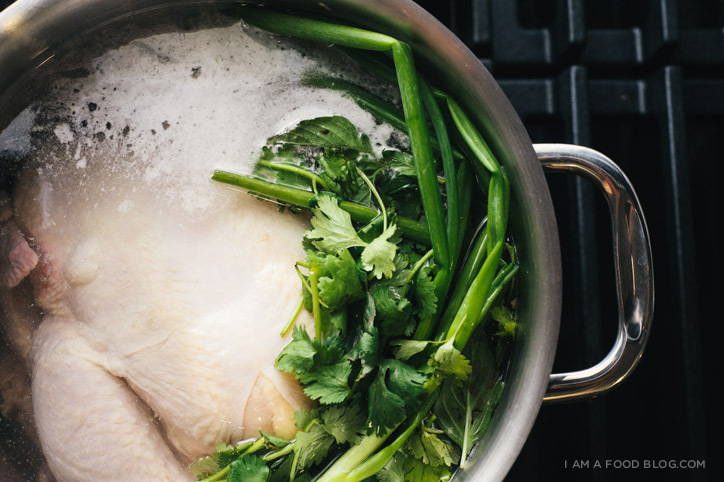 Make the chicken: In a large pot, add the chicken green onions, cilantro, ginger and salt. Fill pot with enough cold water to cover the chicken by an inch. Bring the pot to a boil over high heat and then turn to low simmer. Simmer for 40-50 minutes, depended on the size of your chicken. 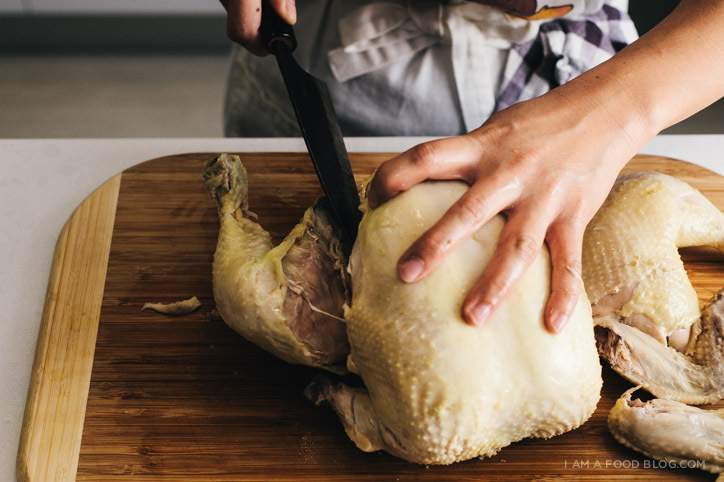 The chicken is cooked when an instant read thermometer in the thigh reads 170°F. When cooked, remove the pot from the heat. 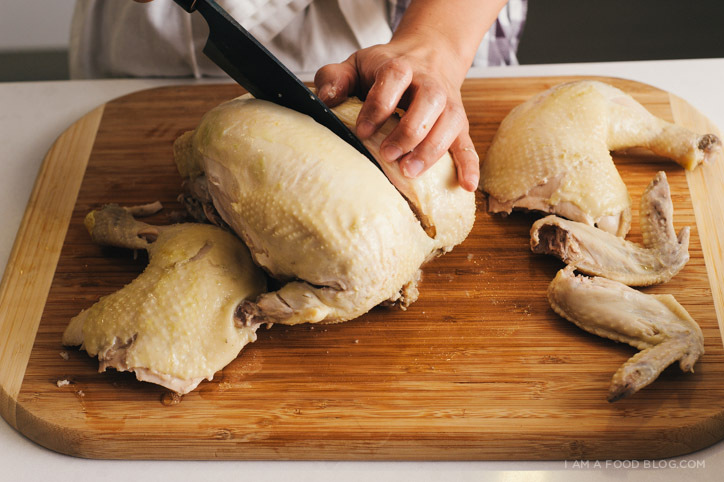 Carefully remove the chicken from the pot and plunge into an ice bath. Let cool then either carve or shred the chicken. Make the green onion oil: Heat up the canola or grapeseed oil in a small pot with high sides over high heat. When the oil is shimmery and hot, add the green onions, garlic, shallot, and ginger. Be careful, the mixture will bubble. Remove the pot from the heat and stir in the sesame oil. Salt to taste. Make the gingery fish sauce: Crush the garlic, chili and sugar together in a mortar. Transfer to a bowl or large liquid measuring cup, add the ginger and dissolve the sugar, garlic and chili mixture with the water. Add the lime juice then fish sauce. Make the rolls: Take a rice paper wrapper and completely submerge it in a bowl of hot tap water for 10-15 seconds. Place the wrapper on a plate – it’ll continue to soften as your assembling your roll. Add fillings as desired. I like to make them like this: lettuce, mint, cilantro, chicken, green onion oil, cucumbers, vermicelli and another small piece of lettuce to hold everything in. Fold the bottom half of the wrapper up over the filling, hold the fold in place, fold in the sides and roll. Enjoy with the gingery fish sauce and repeat. I have leftover chicken, I have rice paper… I think this is lunch. I like to eat Hainanese chicken rice. 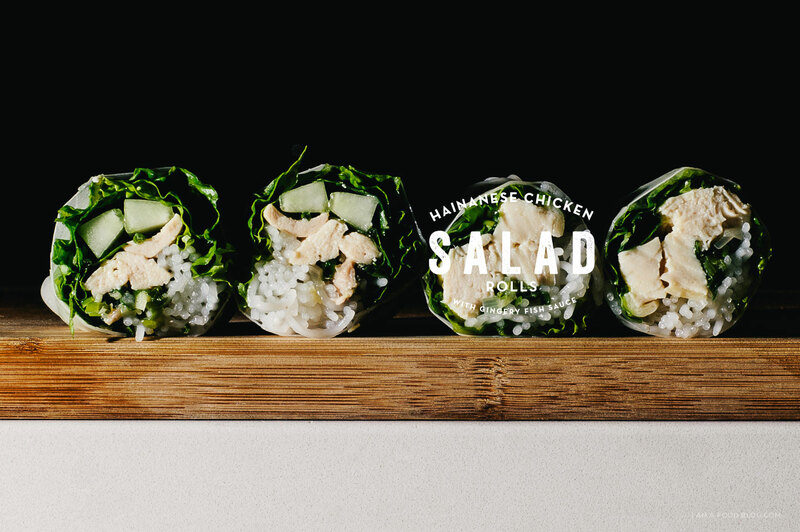 But, I never tried Hainanese Chicken Summer Roll. It looks like Sushi. I will try this recipe. Thank you. Chicken rice is amazing! This seems like a great twist on it. BTW, what kind of knife is that? Looks gorgeous! It’s a just a random carbon-steel Japanese knife, but I’m not too sure which brand – I bought it so long ago I forget! Woahhh ginger in garlic’s stead in nuoc cham? Is there a name for this version? I’m so fascinated. Would a mortar and pestle be appropriate here or is a fine mince more common, as you mentioned? This sounds absolutely delicious — love your directions and beautiful photos. 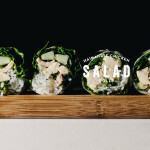 We enjoy make-your-own salad roll nights too, I definitely want to try these flavors. Thanks Steph! Whoops, didn’t see this comment until now! Fish sauce with ginger is normally eaten with duck. My mother-in-law always chops up the ginger, I haven’t seen it ground in a mortar and pestle-maybe it would be too fibrous? 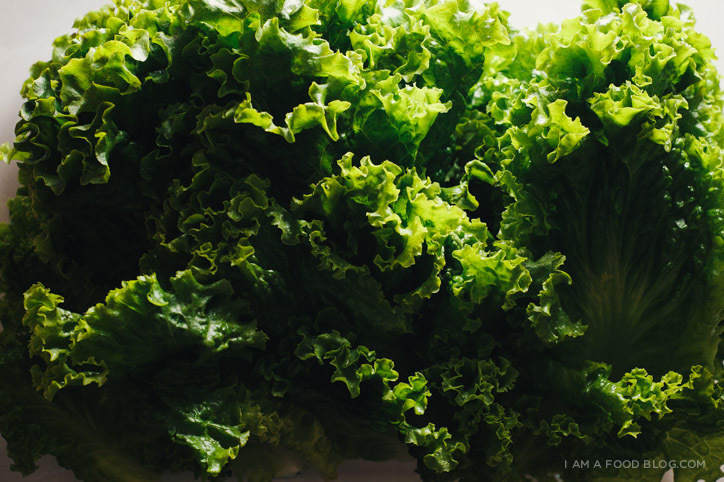 It’s super-delicious with poultry, hope you give it a try! Sorry , i dnt agree with this recipe..if you use the rice paper then you cant enjoy the sofe and juicy chicken favour that match with chicken rice and the sauces….you may just try the original vietnamese chicken roll which is simple to make and taste better as vn rolls is meant to be simple and tasty with mints and fish sauce…..there re some crazy version out there, some is acceptabe as being different not this one . Shut up Peter. Who appointed you adjudicator on what fillings for rice paper rolls are permissable. Sounds delicious. where are your beautiful navy-rimmed plates from?! I wonder… since this isn’t a true chicken stock, do you save the broth for other uses? I do save the broth! Sometimes I use it instead of water when I cook rice or other grains. Adds a light chicken-y flavour!